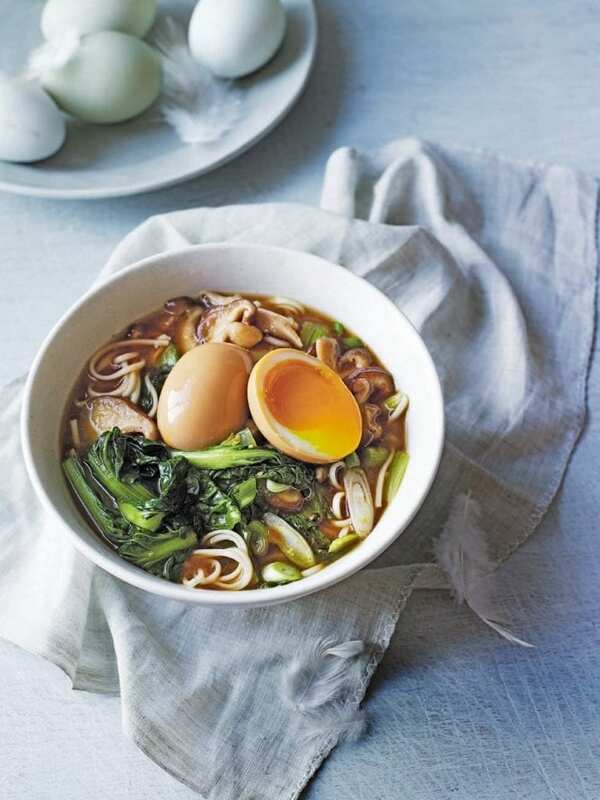 This Japanese egg and shiitake soup recipe packs a punch with earthy shiitake mushrooms and fresh Asian greens. Prepare the eggs ahead of time. Bring a pan of water to the boil, then add the eggs and cook for 3-4 minutes. Remove and cool under cold running water. Peel carefully, as they’ll be very soft. Mix the soy sauce, mirin, sake and sugar in a sealable plastic bag. Add the eggs, making sure they’re covered by the liquid. Seal and leave for 2 hours or chill until needed (see tips). If chilling, bring to room temperature before making the ramen. For the ramen, heat the oil in a pan and gently fry the garlic for 30 seconds. Add the stock and miso paste, then bring to a simmer, stirring until dissolved. Add the mushrooms and choi sum/pak choi stalks, then simmer for 5 minutes. Add the leafy greens, soy sauce, toasted sesame oil and cooked noodles. Simmer for 1 minute. Stir in the sliced spring onions and nori seaweed strips. Ladle into bowls, then serve straightaway, topped with halved marinated eggs. You’ll have lots of marinade left to dress Asian salads. It will keep, chilled, for up to a week. The cooked eggs will keep in the marinade (see step 1) in the fridge for 24 hours. Mirin is a sweet rice wine and sake is a dry, wine-strength tipple made from fermented rice. Both are regularly used in Japanese cooking and available in supermarkets. Dry sherry is a decent substitute for sake if you can’t find any.